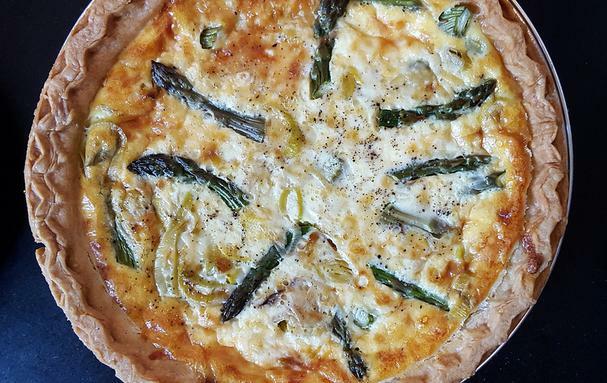 Quiche is such an easy thing to make and so deliciously rewarding. 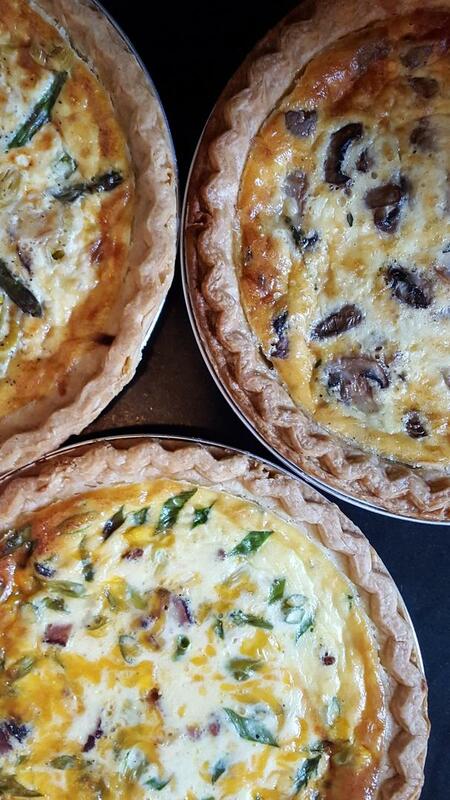 After making four quiches for Easter brunch I thought, why don’t I make quiche more often? They wowed the crowd and took little effort on my part. Plus, they were super easy to transport. I start with the Roasted Tomato, Thyme and Goat Cheese Quiche as the tomatoes will take about 45 minutes to roast. Alternatively, you can use store-bought roasted peppers or sun-dried tomatoes, both of which are quite delicious in a quiche and especially paired with goat cheese. The rest of the ingredients are simple, requiring just a bit of sautéing and chopping here and there. Mise en place (aka “putting in place” or simply getting organized): I recommend placing the ingredients for each quiche on a dinner plate, that way you’ll be ready to go for assembling. In a large bowl, whisk together eggs, cream, salt and pepper. Place cherry tomatoes on a foil lined baking sheet (for easy clean-up!). Spray with olive oil and season with salt and pepper. Roast in a 375° F oven until nicely browned and well-roasted; about 45 minutes. You want them to lose most of their moisture and become flattened, so don’t take them out of the oven too soon. 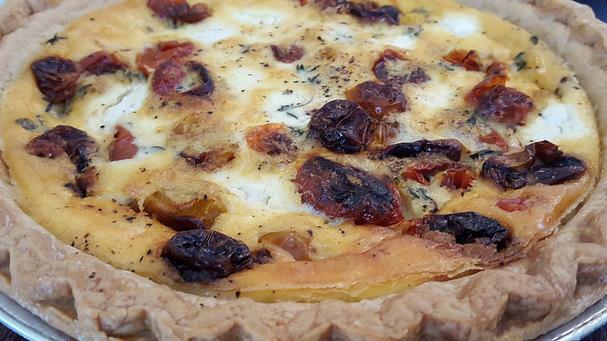 This will also help prevent your quiche from becoming too soggy. Using a measuring cup, fill with 1/4 of the quiche batter, or enough to just reach the bottom edge of the crust. I used bacon ends (thick chunks of bacon) then cut it into smaller bits. 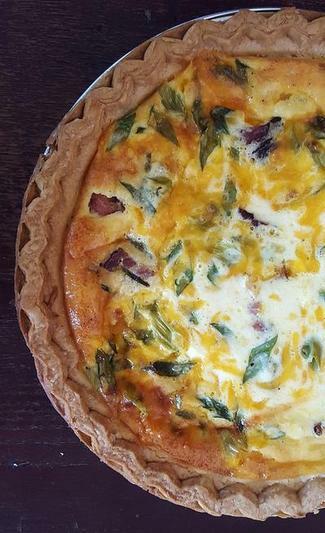 This gave the quiche a nice hearty component, but you could simply use rashers of bacon cut into bits. It’s entirely your preference. Toss bacon pieces, green onion and remaining Cheddar together, then add to the pie crust. Bake quiches on the bottom racks of a preheated 350° F for 50 minutes or until a knife inserted in the centers come out clean. 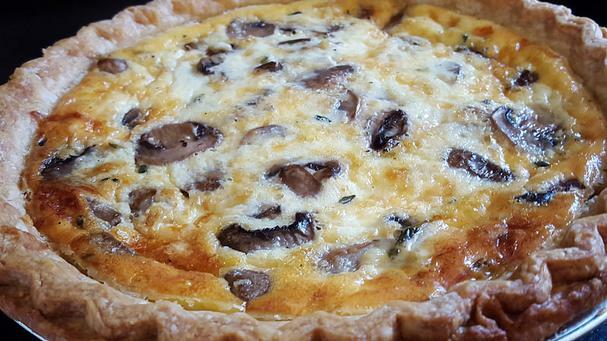 Let quiches stand 15 minutes before serving.